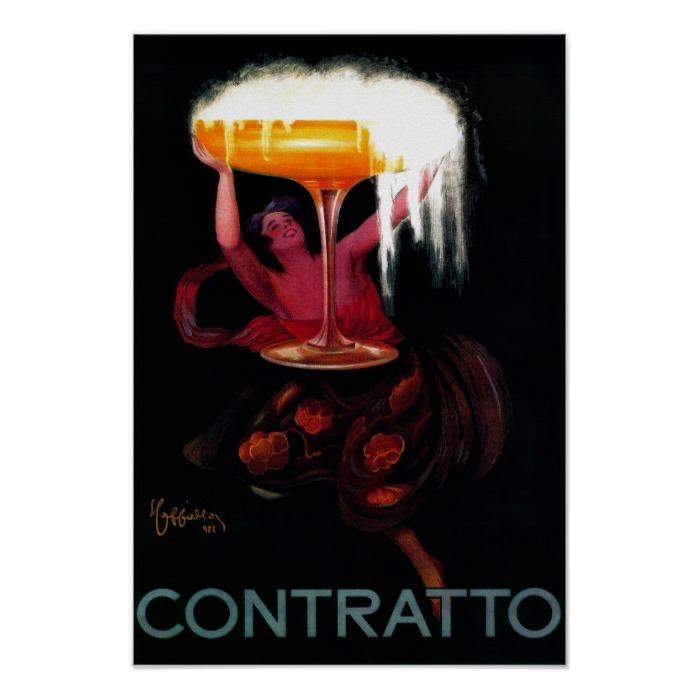 A rich, glowing, beautiful, vintage advertising poster for Contratto, an Italian winery founded in 1867, known for being the oldest producer of sparkling wine in Italy. Features a happy, cheery woman holding aloft a giant champagne flute overflowing with golden sparkling contratto. A classic advertising poster by Italian designer Leonetto Cappiello - he's called "the father of modern advertising" because of his innovation in poster design. This artwork is also available on other products, like luggage tag, keychain, binder, iPad case, gift bag, and more. A striking vintage art custom poster, great for adorning your walls. You may even get the print framed while ordering.